Figure 8. Reactivation of the primary metabolic pathways and energy production during early seed germination and its possible relation to early transcriptome changes in Arabidopsis thaliana. Glycolysis, aerobic (TCA) and anaerobic (fermentation) respiration are the commonly used pathways for ATP production. The diagrams provide early transcript expression patterns for key genes representing these metabolic pathways as evident from the transcriptome analysis of non-dormant, non-stratified after-ripened Arabidopsis Columbia seeds (Nakabayashi et al., 2005; Preston et al., 2009) available via the seed-specific eFP-browser at www.bar.utoronto.ca (Bassel et al., 2008; Winter et al., 2007). Transcript levels are only presented if an early up-regulation of at least two-fold was evident (0-24 h). Key enzymes and pathways for which transcript levels are up-regulated are labelled in red, while others are labelled in black. Fermentation-related transcripts (pyruvate dehydrogenase, PDC1, lactate dehydrogenase, LDH) are transiently up-regulated during early Arabidopsis seed germination. The transcript expression patterns in Arabidopsis seeds support the early up-regulation of glycolysis (phosphofructokinase, PFK (irreversible step), pyro-phosphate-dependent phosphofructokinase, PFP, pyruvate kinase, PK), TCA (SCoS, SDH, MDHm), and OPPP (provides NADPH and precursors, 6-phosphogluconate dehydrogenase, 6PGDH), but not of gluconeogenesis (e.g. phosphoenolpyruvate carboxykinase, PEPCK), sucrose production (sucrose synthase, SUS1-6), fatty acid transport (comatose, CTS), fatty acid beta-oxidation (acyl-CoA oxidasee, ACX), glyoxylate cycle (isocitrate lyase, ICL), and the gamma-aminobutyric acid (GABA) shunt pathway (glutamate decarboxylase, GAD). Seed-specific routes that may contribute to ATP production include (1) the "seed glycerol shunt pathway" (TAG lipases, GLI1/NOH1, G3PDHc) for which we propose that AtTGL-type TAG lipases are involved and (2) "Perl's pathway" (PEP carboxylase, PEPC, MDHc, PK) which includes amino acid aminotransferases (AspAT, AlaAT). 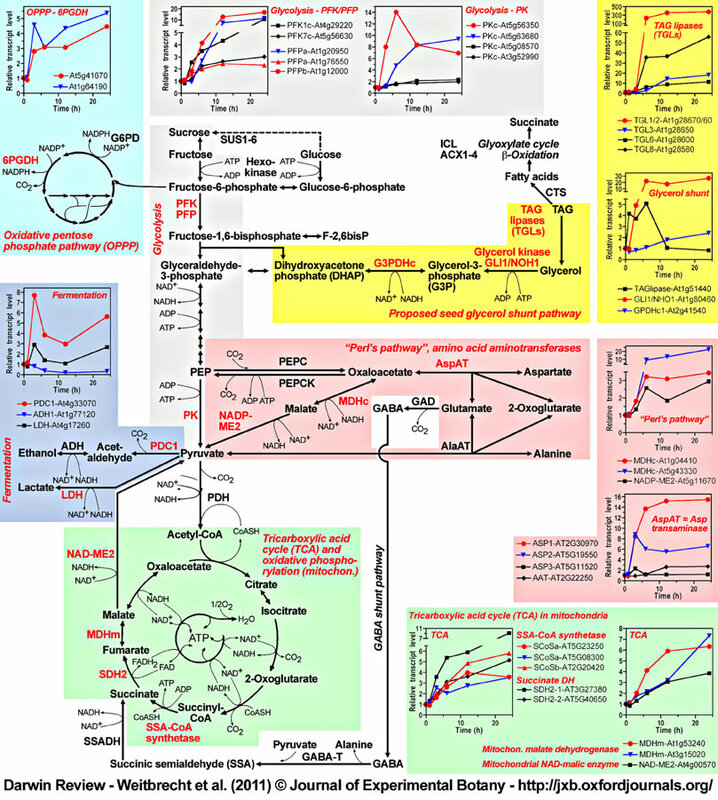 The pathways presented describe metabolic routes in cytosol and mitochondria. Note that transcriptome results of cold-stratified seeds may differ and that early up-regulation of transcript levels provides hypotheses, but is not necessarily associated with the accumulation of protein and activity of the corresponding enzymes.